Mischievous weather will take hold this week from coast to coast. A major storm system barreled through America's heartland over the weekend, wreaking havoc from the Great Lakes down to the Gulf Coast. Mississippi, Alabama and Georgia got battered with at least 8 reported tornadoes that left little wastelands of destruction in their wake in cities like Columbus, Mississippi. 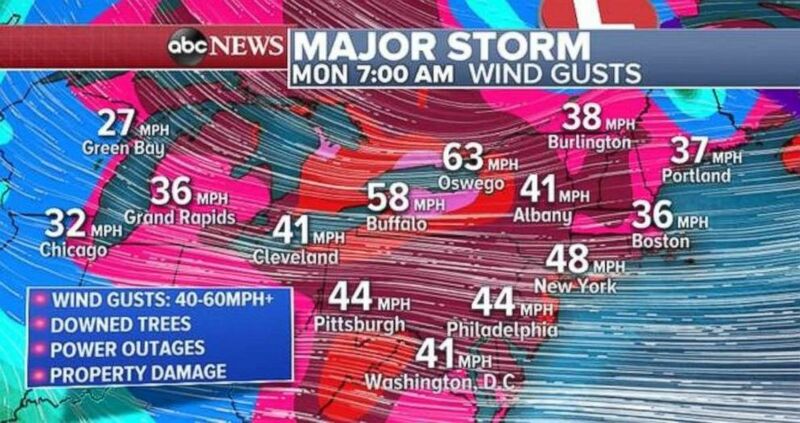 (ABC News) Gusty winds will move into the Northeast on Monday morning with the potential for downed trees, power outages and property damage. In Mississippi and Tennessee, 8 to 10 inches of rain have been pushing rivers to rise over their banks, with flooding in area neighborhoods worsening into Monday morning. Meanwhile, further north, 10 to 16 inches of snow blanketed the Plains and Great Lakes with drifts piled 20 and 30 feet high. In southern Michigan, the National Guard were called out to rescue people trapped inside their cars amidst blinding blizzards in places like Owatonna, Minn. In Austin, Minn., snow drifts paralyzed commuters, with snow drifts that sealed garages beneath roof-high snow. Punishing winds gusted from the Midwest up through the Northeast, with wind speeds of 50 to 75 mph that downed power lines, trees and ripped residential roofs from their foundations. The wind in Niagra Falls in upstate New York walloped area lakes so hard it drove massive boulders of lake ice ashore, which piled up 10 to 15 high. 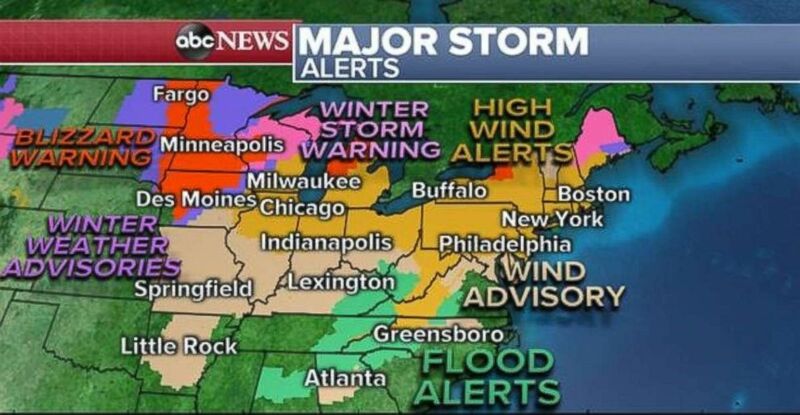 (ABC News) Alerts are in place across most of the Midwest and Northeast on Sunday. With the weekend storm blowing out to sea, new, damaging winds are expected to pummel major East Coast cities throughout Monday, with wind gusts reaching near 70 mph in some areas, particularly New England. Bruising winds could spark airport delays on Monday in Boston, New York City, Washington D.C. and Philadelphia. Out West, a blanket of rain was falling by Monday morning, borne on gusty winds that were drenching cities from northern California to Oregon. Much of the upper half of the West Coast is busy facing flooding, snow and high wind alerts. The subtropical moisture will continue to feed into California and southern Oregon through Tuesday and into Wednesday, threatening mudslides and serious flooding. By the time these cantankerous storm systems move off, up to 12 inches of rain is expected to soak the West Coast, with the Sierra Mountains east of San Francisco facing the possibility of an eye-popping weather system that could drop up to 100 inches of snow on the region.